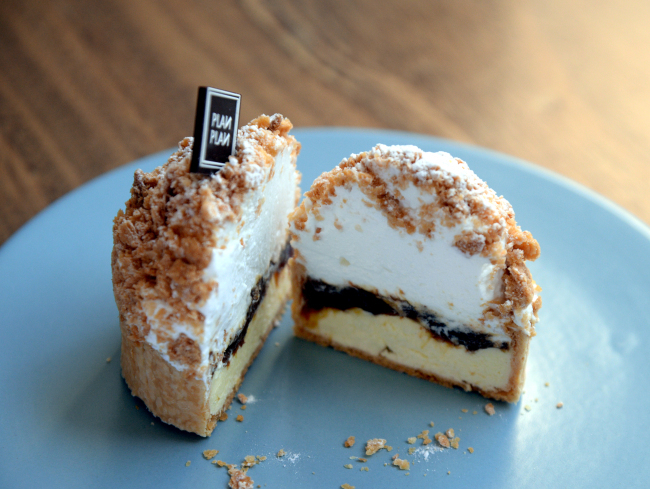 From its small perch in Seoul’s Samseong-dong, Plan Plan is doing creative, structured, delicious things with cake. This tiny 14-seat dessert shop has been spinning out mouthwatering sweets since 2015, infusing mousse cakes and other treats with its own aesthetic. 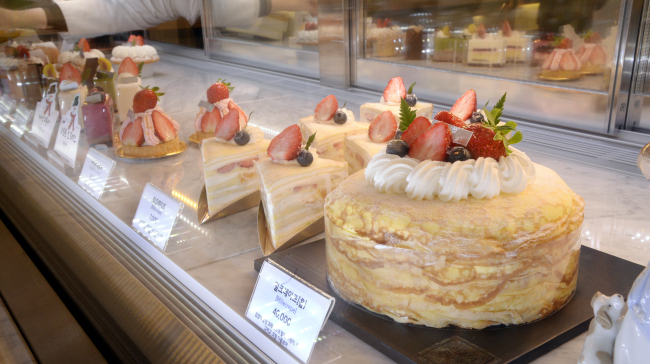 The aim is to create toothsome cakes that will even appeal to those who are not fond of sweets, “cakes that one can eat every day,” said Plan Plan co-owner and pastry chef Moon Sun-young, 39. 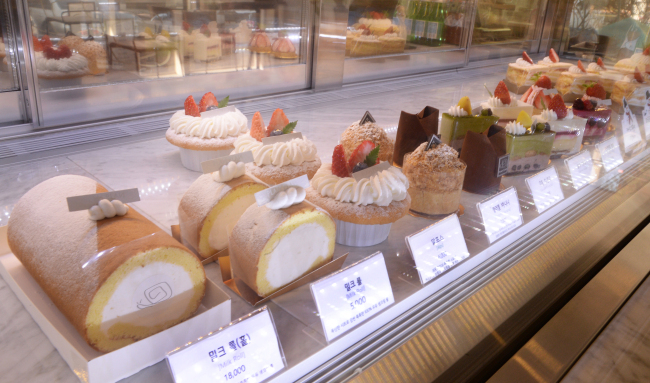 Both Moon and co-owner and pastry chef Kim Eun-sook, who first met while studying pastries and baking at a culinary academy in Seoul, focus on making sure their cakes are not too sweet and not too heavy. 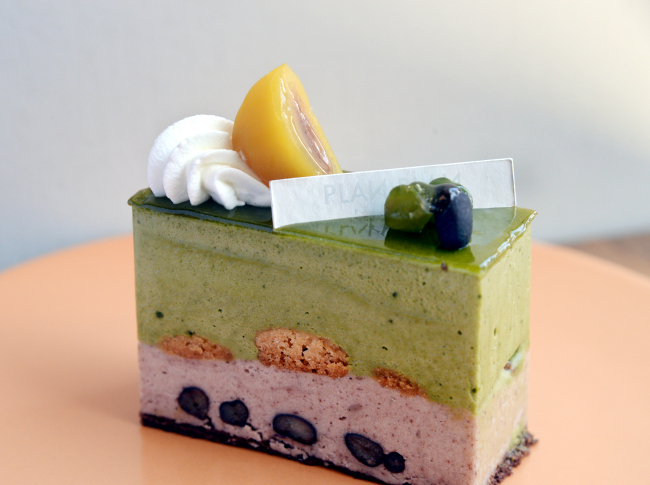 That translates to cakes like their matcha adzuki -- a balanced pairing of intensely fragrant and bitter pulverized green tea mousse with an incredibly light and nutty red bean mousse. “We use a mascarpone cheese base and a creme anglaise, so that the mousse becomes like matcha ice cream,” said Kim, 36. Mousse on mousse alone could result in a cake with monotonous textures, but Moon and Kim add whole red beans to their red bean mousse and a layer of “soboro” streusel straight through the center that lends a rich crunch to the cake. Then there is Plan Plan’s caramel banana, which, at first glance, looks like a cream puff or a dome-shaped fruit crumble, but, is neither. 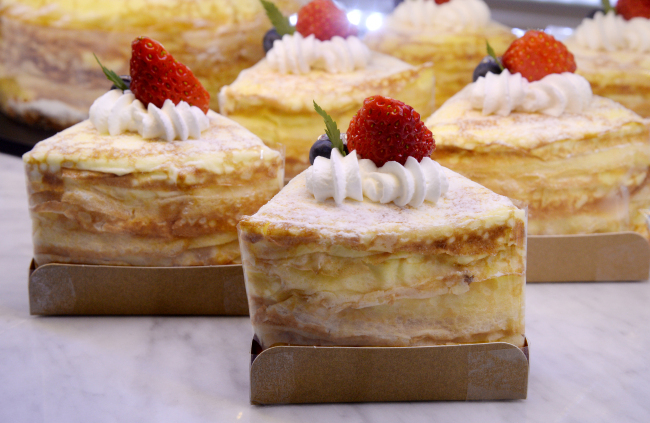 It is, according to Kim, a riff off the classic French dessert, the millefeuille, a sandwiching of paper-thin leaves of puff pastry around thick layers of pastry cream like vanilla mousseline. One slice down the center reveals a carefully constructed cake encased in flaky, buttery layers of pastry with a top layer of fresh cream, a thin layer of caramelized bananas -- sauce-like in consistency -- and a bottom layer of vanilla mousseline cream. “I changed the shape,” said Kim of their take on millefeuille. To achieve that domed shape, thin leaves of puff pastry are crushed and embedded over the dome of fresh cream. Also, Kim decided to add a layer of caramelized bananas to Plan Plan’s version. “I felt that the vanilla mousseline would pair well with the bananas,” said Kim, who caramelizes the bananas before reducing them to a thick sauce that tastes like butterscotch, toffee and pureed banana all at once. Indeed the caramelized bananas go wonderfully with the custard-like mousseline cream, a pairing that some may compare to banana pudding. Kim and Moon also demonstrate their mastery of chocolate with their double chocolate cake, a bittersweet marriage of ganache, alternating layers of chocolate sheet cake surrounded by a thin cylinder of chocolate itself. One bite unfurls intense, not too sweet yet still creamy, still decadent flavors and textures of chocolate, followed by a fragrant wallop of citrus. “We use a lot of Grand Marnier in our ganache,” Kim said. Moon revealed plans to release another new confection.